About once a year, we get a fantastic science fiction film that flies under everyone’s radar. 2014 gave us Under the Skin, 2015 gave us Ex Machina, 2016 gave us Arrival, and 2017 gave us Blade Runner 2049. 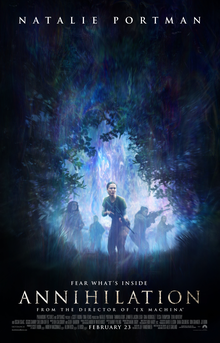 I fully expect this year’s under-appreciated science fiction movie that will appear in my Top 25 list will be Annihilation, despite the fact that it underwhelmed at the Box Office this past weekend and is getting an international distribution on Netflix because Paramount was worried about modern audiences relating to it. I understand that people want to go see Black Panther, and I understand that people like to stay in their comfort zones with movies, but to allow a movie like Annihilation to waste away unseen is a big mistake. Great science fiction doesn’t need shots of outer space or laser swords. Great science fiction makes us think. Under the Skin, Ex Machina, Arrival, Blade Runner 2049, and now this movie, all make us think about what it means to be human. It’s a challenging and introspective process to see these movies, but the final effect will be more than just lining up to see Marvel’s new movie for the third time. I promise. Natalie Portman’s Lena is a former soldier who has moved on to become an expert in biology. She’s an acclaimed writer and college professor. Her husband (Oscar Isaac) remains in the military, and they live together in seemingly beautiful harmony. He leaves to go on a mission, and it’s not really a military conflict. Instead, an asteroid hit a piece of land outside the Florida coast. Soon after, a rainbow-colored, oily boundary-line appeared, and has slowly expanded miles outside of the coast in all directions. The scientists on the outskirts call it “The Shimmer.” We’ve sent soldiers into The Shimmer to learn about what’s causing this expansion out into our land, but the scientists cannot figure out what’s causing it, and everything they send in to report back with data never resurfaces. It appears to be magnetic on the inside because none of the communications devices work after crossing The Shimmer into the land behind it. When Lena’s husband never comes back, she, along with some other scientists and soldiers, decide to head in after him, craving information about what happened to her husband’s team. What occurs after is very, very intense. The movie has a great ability to build dread as the time ticks by. We know from the trailer that Lena is going in, but the movie takes its time setting up the story. I would liken the pacing to 2016’s Arrival because they both have this sodden and depressing opening that is then lifted up once the mission starts. Once inside The Shimmer, the movie mixes really interesting tones, images, and dynamics. There are some images that are horrifying, and seem so unnatural to the human eye that it will get under your skin. There are some images that are gorgeous and show what a little bit of odd mutation can do to the environment. Imagine Avatar’s jungle if there weren’t boring blue people but instead highly mutated animals and plants that pose a serious danger to our characters. She’s fantastic, as always, in this movie, as is Oscar Isaac and the rest of the supporting cast. The music is great, the visuals are great, and I’m sure I will only like this movie more and more over time, as I try to unpack the different things it was trying to say. I want to sit in the theater and face a two hour challenge like Annihilation offers, and it doesn’t hurt that it has plenty of action, serious scares, violence, beautiful imagery, and well-acted characters. I implore everyone to go see this. It’s been awhile since a true comedy really stood out for me, so I was really surprised when I read that Game Night was getting great buzz. We get a few Oscar-contender dramedies every year that mix a comedic script with a dramatic atmosphere (see Lady Bird, The Meyerowitz Stories, Three Billboards Outside Ebbing Missouri), but the market for pure comedies has been down recently. I was really happy with Game Night. It has plenty of laughs, a plot that works for what the movie is trying to accomplish, and gets the most out of its cast. It deals with a group of friends who gather for a weekly competitive game night. The hosts (and our main characters) are Max (Jason Bateman) and Annie (Rachel McAdams), and they bring over their deliciously dumb friend Ryan (Billy Magnussen), whoever he brings as a date (this time it’s Catastrophe‘s Sharon Horgan), and their friends Kevin (Lamone Morris from New Girl) and Michelle (Kylie Bunbury). One member of the group (Jesse Plemons as Gary) has recently been ex-communicated by a divorce. Their rhythm is a little disrupted when Max’s rich, selfish brother Brooks (Kyle Chandler) comes into town, suggesting that they play a murder-mystery game. The problem? Brooks is in some trouble with the wrong people and the real criminals get him before the actors he hired can, and it leaves the friends debating what’s real and what isn’t. The chemistry between Jason Bateman and Rachel McAdams really works here and there are a few terrifically funny scenes between them. The same goes for Jesse Plemons nailing his comedic role, and Lamone Morris crushing a Denzel Washington impression. The movie finds a way to make its gags work for the sake of the plot, and has scenes like bullet-hole cleaning and car chases that are made funny by our fish-out-of-water characters. The subplot about Max and Brooks’s jealousy for each other and the stress it puts on the less-successful Max is nothing special. You don’t go into a movie like this for the dramatic effect. I got what I wanted out of the comedy and the thriller-based plot where normal people brush up against violent crime. It was used for good visual gags, good slapstick, and even better dialogue, as the movie snaps us from set piece to set piece to refresh us with a new silly situation. It was a really funny, enjoyable movie. If you can’t catch it in theaters, definitely rent/stream this one for a few laughs. If you know me, you may know that I tend to love trashy romance movies as guilty pleasures. Yes, I watch Nicholas Sparks and Twilight and Fifty Shades, yada yada yada. This one, I’d recommend you stay away from. These teen movies can sometimes be worth watching for nostalgia or for the kind of adventurousness that can be interesting to watch. Sometimes they carry with them a decent punch of real-world observation that people a lot older can take from. I really enjoyed Before I Fall last year around this time, and The Edge of Seventeen two years ago was pretty solid. The formula is pretty established. Studios take a rising actress who played an independent role really effectively and then place her in a teen romance/coming-of-age film to try to piggy-back off of the “next big star” mentality. These movies are made without much of a budget, and they hope that over time, the marketability of the star will eventually lend itself to a huge profit. Jennifer Lawrence did Winter’s Bone and landed The Hunger Games. Zoey Deutch did Everybody Wants Some and landed Before I Fall and Vampire Academy. Shailene Woodley did The Spectacular Now and landed Divergent. Hailee Steinfeld did True Grit and then landed The Edge of Seventeen. Kristen Stewart did Speak and then landed Twilight. Emma Stone did Zombieland and then landed Easy A. Chloe Grace Moretz did Let Me In and then landed If I Stay. I think those examples are enough, let’s move on. This time it’s Angourie Rice as Rhiannon, who starred as Ryan Gosling’s daughter in 2016’s fantastic buddy-cop comedy The Nice Guys. She gets a leading role, and tries to make the most out of it, especially because she isn’t able to establish any chemistry with one actor/actress because she’s forced to consistently act across all different people. The plot is a bit bizarre. Rhiannon has this boyfriend, and he’s kind-of a jerk. One day, he seems entirely different, however, and they go to the beach and into Baltimore and have a fantastic time together. The next day, he’s super distant again, but a transfer student appears at the school at treats her really strangely. Here’s the catch: she isn’t in love with her boyfriend, she’s in love with the spirit who lives every day in a different body. It’s tough to handle, for sure, but they weather the storm as Rhiannon grows as a person. I thought that this would be a movie where our main character experiences a very modernized form of romantic discovery, where she stops thinking about gender and sexuality in binary terms and more about a loving the person’s entire being. I was pretty ready for an interesting social dynamic and didn’t really get it. Instead, it was more like this spirit playing match maker for the perfect boy that he will then leave clues to set Rhiannon up with after the spirit learns more about his life during the day. It was nonsense. The acting is not great, the characters are bare-boned, and it doesn’t even carry the emotional schlock that makes these movies worth it. 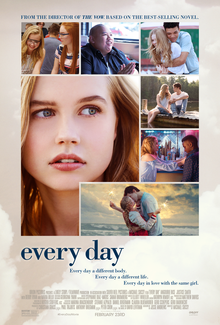 Outside of a slightly interesting concept and a decent performance by a charismatic Angourie Rice, this is one you should skip.